The Confusion and our other vessels are Located at Lake Michigan’s North Point Marina in Winthrop Harbor Illinois 60096. Located just 1 hour North of Chicago and 40 minutes from Milwaukee, North Point is Lake Michigan’s most consistent Salmon and Trout charter fishing port. From early April through mid-November, fishing is at its finest at North Point Marina. Average catches out of this area normally range from 10 to 15 fish per trip. Early Spring catches can consist of limits of mostly Coho Salmon and Late Summer catches include some of the best Chinook (King Salmon) angling on Lake Michigan! Throughout the season we also catch Brown Trout and have some excellent Steelhead action (Lake Run Rainbow Trout). Lake Trout are always around but I generally save them for the Late Season trips. North Point Marina, Winthrop Harbor, IL. 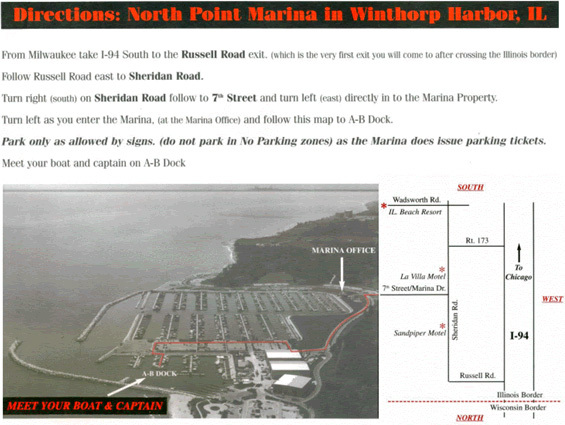 Follow this map of Northpoint Marina below that shows the entrance to the marina from 7th street. The black line is the correct way to the boats. As you can see the boats are located on the lower right of the picture on AB Dock. Go North (Left) to the next stop sign (CHARTER BOATS) North Harbor. This is where you will find “AB-Dock”. The “Confusion” is on Dock AB-11. A common error in most peoples journey is to stop at the gate on the South end of the parking lot that says Dock A & B. Keep driving past this point as I explain above to Dock AB. You may park your vehicle in the ungated lot or on the South Side of the Skipper Bud’s building (Boatyard) on the South Side of the building. Please observe the signs. DO NOT PARK IN THE GATED LOT EVEN IF THE GATES ARE OPEN!! Take I-94 East (South) about 30 Minutes South of Milwaukee to the Illinois-Wisconsin border and exit on Russell Road (State Line Road) East (Left). Go Approx. 6 Miles to Sheridan Road. Go approx..½ Mile South (Right) on Sheridan Road to a stop light at 7th street (Main Street). Turn Left (East) and follow on 7th Street past the R.R. Crossing to the stop sign at the Marina building. (Just on the North Side of The Yacht Club). Half way down the dock on the left side. 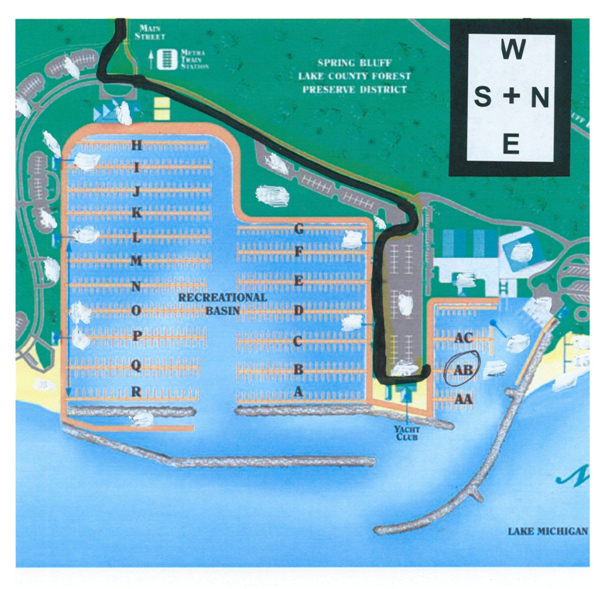 You may park your vehicle in the ungated lot just west of the Dock AB Entrance or on the South Side of the Skipper Bud’s building (Boatyard) on the South Side of the building. Please observe the signs.